Congratulations to Julia and Aspie Avengers who are our first winners of Worcester Soup, taking away a crowd fund of £324.65. Here is some background on Aspie Avengers and the other 3 pitchers on the night. All of you did an amazing job. ASPIE is a social self-help group for adults with Asperger’s where members do not have to ‘pretend to be normal’. The low pressure environment, tailored to their needs, allows them to breathe joining in board games, discussions and quizzes, guitar night, meals out etc., plus computer/internet access for strategic games, job searches, CV preparation, course work etc. 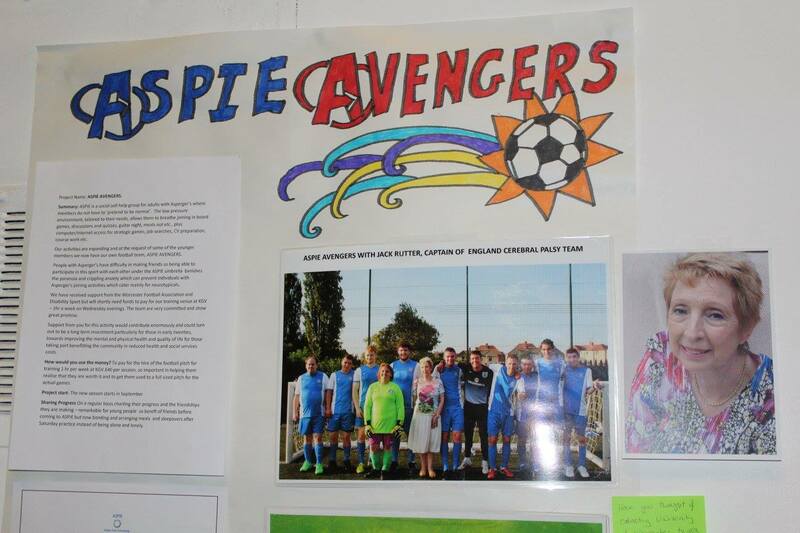 Our activities are expanding and at the request of some of the younger members we now have our own football team, ASPIE AVENGERS. People with Asperger’s have difficulty in making friends so being able to participate in this sport with each other under the ASPIE umbrella banishes the paranoia and crippling anxiety which can prevent individuals with Asperger’s joining activities which cater mainly for neurotypicals. We have received support from the Worcester Football Association and Disability Sport but will shortly need funds to pay for our training venue at KGV – 1hr a week on Wednesday evenings. The team are very committed and show great promise. Support from you for this activity would contribute enormously and could turn out to be a long term investment particularly for those in early twenties, towards improving the mental and physical health and quality of life for those taking part benefitting the community in reduced health and social services costs. How would you use the money? To pay for the hire of the football pitch for training 1 hr per week at KGV £40 per session, so important in helping them realise that they are worth it and to get them used to a full sized pitch for the actual games. On a regular basis charting their progress and the friendships they are making – remarkable for young people so bereft of friends before coming to ASPIE but now bonding and arranging meals and sleepovers after Saturday practice instead of being alone and lonely.